Want a day out on the water, but lacking a boat? You’ll be taking to the ocean in no time with one of these boat rental companies, which can set you up with a sailboat, motor boat, kayak or canoe for a fun day cruising the Ocean State shoreline! At Wickford Boating Rental, you can become a part of the Captain’s Club, a pre-paid discount program that allows you to rent any boat in the fleet from a half day up to multiple days. They strongly prefer those with a Rhode Island Boaters Safety Course certification, so make sure to get experience before you start renting! Are you a recreational or professional fisherman? A family just wanting to see Rhode Island? Or a tourist exploring the Ocean State? Steve’s will transport you to the water’s edge with the boat you’ve rented, supply the life jackets and even maps, and then you’ll be good to go for a day of boating yourself! Rent kayaks, tandem kayaks and paddleboards all from the top brands at East Boast Paddle Sports! They also have plenty of stand-up paddle boards and accessories for sale there as well! Head out to Lincoln Woods State Park to rent a kayak and take a lesson! Their comprehensive full-day course will teach you the basics, or you can take a more advanced course to learn what it takes to get out onto the open ocean. With the Providence River snaking through downtown, kayaking is one of the best ways to explore the state capital! Rent a kayak for 45 minutes or an hour and a half and explore around the waterfront for yourself. 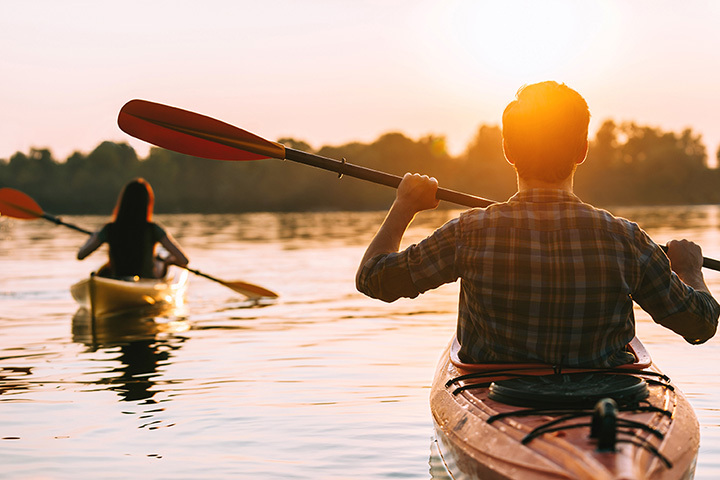 Starting Memorial Day weekend, you can rent kayaks, double kayaks, stand up paddle boards and more from the Kayak Centre’s two locations in Charlestown and Wickford. They’ll make sure you have everything you need to spend a pleasant day out on the water. Located at Prime Marina, this boat rental place carries a wide variety of kayaks that will work for touring or fishing. They’ll make sure that you’re taken care of during your entire trip. Looking for a more powerful ride than just a kayak? Here, you can rent a pontoon or speedboat for the day. Employees will make sure to give plenty of instruction before you head out on the water, so you can feel confident whether you’re a novice to boating or an experienced navigator. The best way to explore Newport? By boat, of course! Enjoy your own self-guided tour between 9 and 6 p.m. every day. You can choose from a boat, jet ski, paddleboard or kayak—all of which are available at affordable prices! Why own a boat when you could use one of Freedom Boat Club’s anytime you want? They own plenty of pontoons, deck boats, and cabin boats, all of which stay clean and proper when maintained by the folks at Freedom.